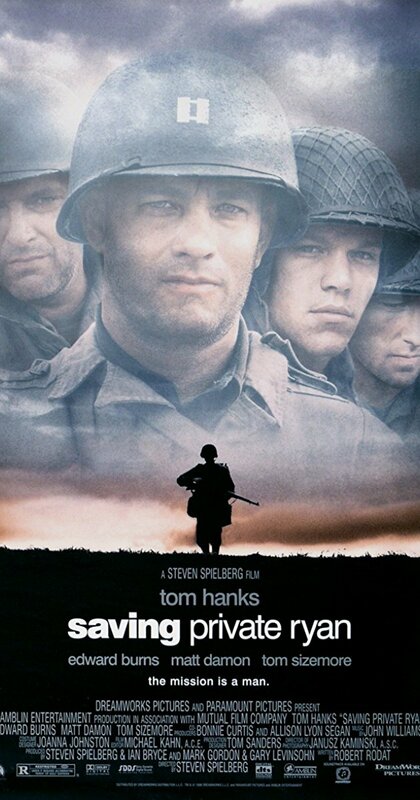 Saving Private Ryan is widely acknowledged to be one of the best war films ever made. Released in 1998, the film quickly became both a critical and commercial success, and was soon nominated for 11 Oscars – ultimately going on to win five (including both Best Picture and Best Director). Spielberg was praised for challenging both audience desensitization and the idea of World War II as some sort of “glamorous” or “romantic”  affair, and said he “wanted to achieve reality”  in his portrayal of the conflict. In particular, the first half-an-hour of the film has received especial praise for its brutally intense portrayal of modern warfare – and was reckoned to be so realistic that many PTSD-prone veterans were advised not to go see it. Furthermore, in a society increasingly marked by its effeminacy and the specter of the ‘nu-male’, the film offers a refreshing glimpse of the rugged masculinity we associate with the ‘greatest generation’ – e.g. ‘when men were men’ (Spielberg claimed the character of Captain Miller was based on his own veteran father). This makes the film one of the few examples of positive male role models in modern cinema, and it is no doubt for this reason that (despite Spielberg’s liberal leanings) the film remains a conservative favorite. Thus, the Germans become not people, but targets, to be gunned down like so many cardboard cutouts in a shooting gallery. The film basically becomes Skinner’s ‘operant conditioning’ in cinematic form: like Pavlov’s dog, we are trained (through the promise of emotional release) to metaphorically ‘shoot’ the German without even making the decision to do so – it becomes an unthinking reflex. The scene with Private Jackson in the bell tower thus assumes a more sinister meaning. When Jackson fixes a German in his crosshairs, we are not merely passive onlookers (Spielberg specifically noted that he “didn’t want … the audience to be spectators” ) – we are emotionally present, and we will him to shoot. When he pulls the trigger, we are pulling it in our minds along with him. There is much more I could say on the dehumanization in the film, but would take it would take too long to express through the medium of the written word , so for now I’ll restrict myself to focusing on just one of the film’s more disturbing subplots: that of Steamboat Willie and Upham. Unlike some of the other subtler methods we’ve talked about, this one is surface-level enough to disturb many of the film’s viewers. Quite apart from this ritual dehumanization, though, is what the saga of Steamboat Willie represents: Captain Miller’s failure. Though “act of humanity”  in freeing Steamboat Willie (against his better judgement) is ostensibly meant to convey the strength of his moral fiber even in the moral wilderness of war, this reading of the scene is confounded by the results that such an act reaps. When he gives into his humanity and frees the hapless soldier, we would reasonably expect that an act of goodwill will reap good consequences somewhere further down the line – perhaps Steamboat Willie will corner Miller at some future point, but decide to spare him. After all, isn’t this the basic lesson of moral reciprocity we have been taught since birth – ‘do unto others as you would have them do to you’? The film thus essentially becomes a Jewish religious narrative. What other message can we take away than that the apparent purpose of gentile lives is to be sacrificed en masse to save the Chosen People? Yet this was the real impetus behind World War II. We did not have to go to war against our European brothers – we could have made peace with Hitler in 1939 (who himself tried to do so several times before and after the outbreak of war). In truth, it was not Hitler that was set on war, but Churchill. Seen in this light, one of the more personal moments in the film – Miller’s injunction to Ryan at the film’s ending to “earn this” – becomes an interesting look into the Jewish psyche: it reveals the complex relationship they have with their experience of World War II. Unlike many of the world’s other ethnic groups, the Jewish people have existed as a diaspora for the last few millennia. Thus, one of the overriding drives in the Jewish mentality is the need to maintain their cohesion in a hostile culture – and one of the best ways of doing this is through shared experience. In a recent poll by the Pew Research Center, around 70% of U.S. Jews said commemorating the events of World War II was an essential criterion of Jewishness (above even Jewish ancestry). This is why their relationship with the Holocaust is so complex – because, in a perverse sort of way, they need it.